A few days ago i was so lucky to attend a small get together at a swanky hotel in London to help to celebrate the Launch of some exciting new Products from the Sunkissed Range of Self Tan Products. From the start of September some lovely new gift sets will be available exclusively on www.sunkissedbronzing.co.uk and i got to see them first, as well has take Champagne afternoon Tea with Lucy Mecklenburgh who has become the brands Ambassader. Lucy is Elegant and the perfect Ambassador for the products and after spending some time with her on thursday, i found her to be so enthusiastic about the brand. Sunkissed has been around since 2005 and sold bronzing product to us, but then moved into launching self-tan products to help you achieve a beautiful and natural looking tan all year round. The SUNKISSED self-tan collection has been designed to provide a complete tanning regime from preparation, through to instant tan and moisturising tan maintenance. The New Gift Sets are being launched very soon on the Sunkissed Website and they will range in price from £5 to £15, so they are a great affordable price too. The gift sets are great and would make a tanning fan very happy for christmas, You can be confident that when you buy a gift set, all the colours will compliment each other and the powders are silky and soft, making it easy to apply. Here is the Beautifully bronzed gift set, it is available is medium and dark mousse and comes with a handbag sized bronze compact and a kabuki brush. This is the perfect set for you to keep your party glow during the party season this year. The mousse is also one of Lucy's personal favourites. This gift Set is the Bronze Masterclass set and contains everything you need to get the bronzed look. This set is perfect for enhancing your tan and adding a natural glow. Its great for contouring, highlighting and adding a little bit of shimmer, i love the way the colours complement each other. Another of the Sunkissed products i have actually fallen in love with is the eyeshadow and blusher palette, they are available on the website for £5.99 and again the powders and so soft and smooth to apply, this is on my christmas list (incase my children are reading this ). 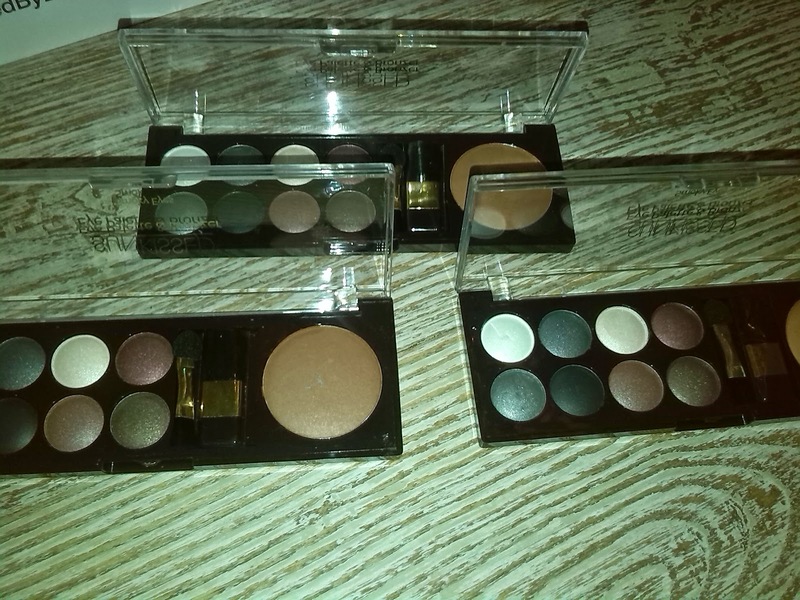 These palettes give a great smoky eyes look and they include colours that you wouldn't normally see in a smoky eye palette. ALWAYS exfoliate, if you don't you will have those annoying little dry bits and dead skin that will show up and ruin a brilliant tan application. Don't over apply the Self tan! even if you think it hasn't covered properly, wait and leave it as you can add more later, but if you over apply you will end up with patchy tan! You can also find Sunkissed on Twitter, Youtube and Facebook to keep up with all the news and competitions.